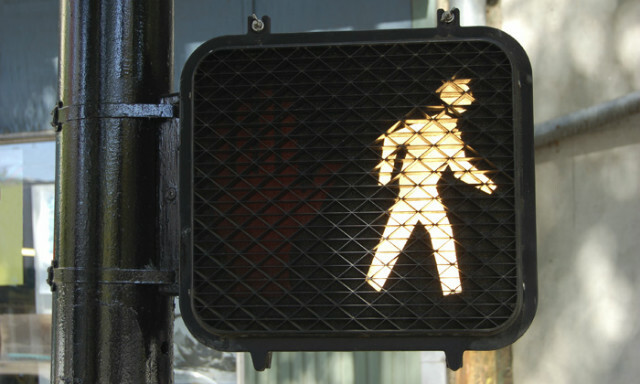 In London pedestrians will soon be waiting to cross the street at "smart" crosswalks equipped with sensors and cameras. The city government of London has recently announced plans to test out the new crosswalks at London intersections this summer. The system, called Pedestrian Split Cycle Offset Optimisation Technique (SCOOT) uses cameras to figure out how many people are waiting to cross the street and adjusts traffic signals accordingly. So if there is a large crowd waiting, for example, the signal to walk will last longer, giving the crowd more time to cross the street. "This really is a fantastic example of how London is leading the way by using 21st century technology to help make it easier for people to get around our great city," said London's mayor, Boris Johnson, in a statement. "Innovation like this is key to keeping London moving efficiently and making our roads safer for everyone to use." Testing for the new crosswalks will begin this summer at intersections outside London's Balham and Tooting Bec Underground stations. London will be the first city to use this kind of technology in its pedestrian crossings, though SCOOT is already used in traffic lights, to help control traffic congestion, in London and other cities around the world, including Toronto, Beijing and Santiago. Transport for London, the agency overseeing the project, is also working on a "call cancel" feature, which would be able to detect when a pedestrian, who has already pushed the button to cross, walks away or crosses the street before the signal changes.